Our team of professionals are ready to help you 24 hours a day, 7 days of the week! Our team of professions are ready to help you. Call us now and let us get you back on the road! If your vehicle has broken down and you can't get it started, you can count on us. We offer complete roadside assistance, and we'll even tow your vehicle to a shop if we cannot get it started. 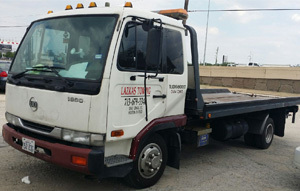 Lazkas Towing offers 24 hour immediate response services!